Christopher Nolden and Lyciera Williams, both 18 and students at Uintah Basin Technical College in Roosevelt, use torches to cut a metal ribbon at the opening of the school’s new Welding Technology Building on Thursday, March 21, 2019. 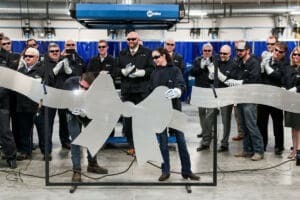 (Roosevelt, Utah)— March 21, 2019– Equipped with plasma arc cutters, Union High School seniors Christopher Nolden and Lyciera Williams got the honor of cutting a sheet metal ribbon marking the opening of the Uintah Basin Technical College’s new welding technology building on Thursday. “This building’s for you. 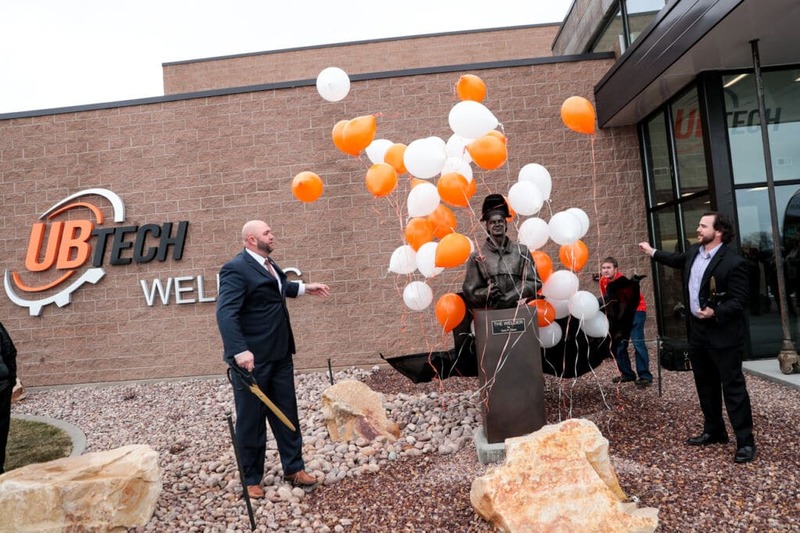 This building is for the future of the generations that are going to come for the future of welding, not only in the Uintah Basin but throughout the state and globally as well,” Weight said. “I had all the opportunities to go wherever I like. But as I got older I just decided college wasn’t right for me and wanted to educate myself however I could,” he said. “It’s so beautiful. I walked in and I was like ‘Oh, it’s so nice. I’m so excited to use it and see the new welders.’ The new kids who are going to come in and use it and see how good the school’s going to be to them. I’m so excited to use all the materials and the new torches, like the new torch I just used. 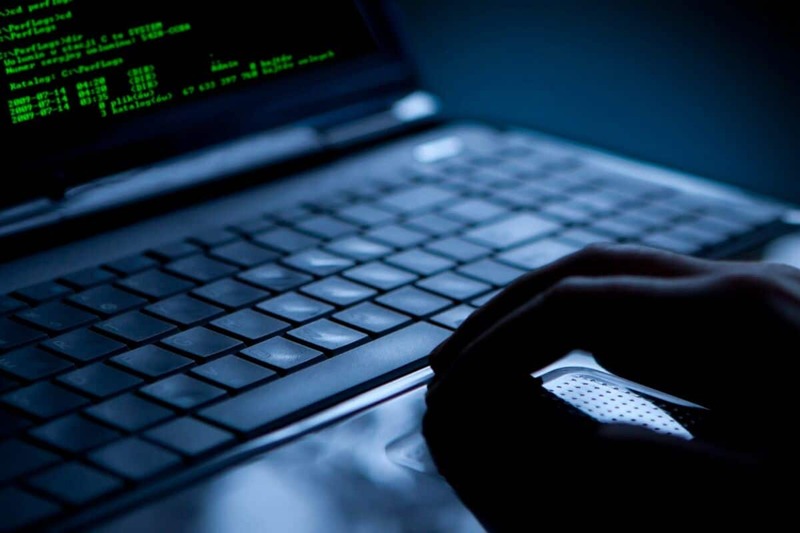 That worked very well,” she said. Welding instructor Kevin Mitchell said there is high demand for welders in the area, particularly in oil and gas industries. 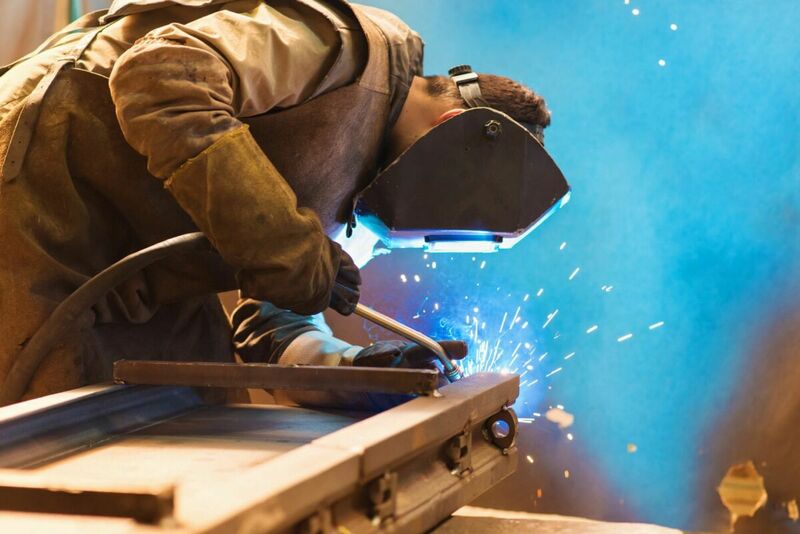 Depending on a student’s training and experience and the job, welders can earn $15 to $120 an hour. Once students complete certificate programs, they can roll over their hours into college degrees at Utah State University’s campus in Roosevelt, which is another boon, he said. Thursday’s events also included the unveiling of a sculpture of a welder created by Utah sculptor Scot Olson. 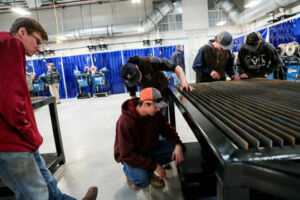 Olson said he was inspired by the idea of students “gaining skills and confidence” as they learn the latest welding technologies in a new setting. “They gain something that’s going to bless their communities, something that is going to bless their families. Welding is an amazing career. 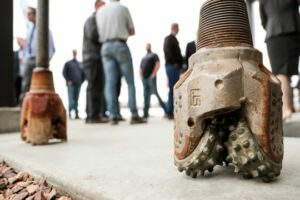 I couldn’t do what I do without the welders who help me do it,” Olson said. Alec Goodrich, 16, who is enrolled in classes at Uintah Basin Technical College, and his father, Jesse Goodrich, both of Vernal, check out welding stations during the opening of the school’s new Welding Technology Building in Roosevelt on Thursday, March 21, 2019.